Inside: Labels aren’t just on jars. We often label our kids in detrimental ways. But what if we switched our perspective? What if we changed the way we saw our kids? This one word that is crushing your child’s confidence is easy to change. I was the bossy know-it-all, it’s nice to meet you. We’ve been getting labeled and labeling others for so long, it’s engrained into our everyday behaviors. The labels others chose for us, and the labels we chose for ourselves, tend to stick with us years after they should. It’s kept a great many of us busy paying our therapist bills. And now that we’re parents, we’re consciously or subconsciously doing the same thing to our kiddos. It’s so easy to label our kids. One simple word can mean everything. He’s the artist of the family. But the words we’re choosing can be detrimental. Our words become our kid’s inner monologues. We get into their heads, just like our parents got into ours. We yield a tremendous amount of power-for lack of a better word- over our children’s thoughts about themselves. So we either set our kids up to be self-conscious or we set them up to be confident. They will either have self-doubt or self-assurance. And I want my kids to not just survive their childhood. I want them to thrive in it. I want them to feel like they are Superkids. To know they are Superkids. I want no doubt to creep in. My job is to empower them so they embrace and love who they really are. How can I change the way I see their behavior? How can I reframe the way I interact with my children when they’re exhibiting-ahem-less than desired behaviors? By changing the way we see our children. 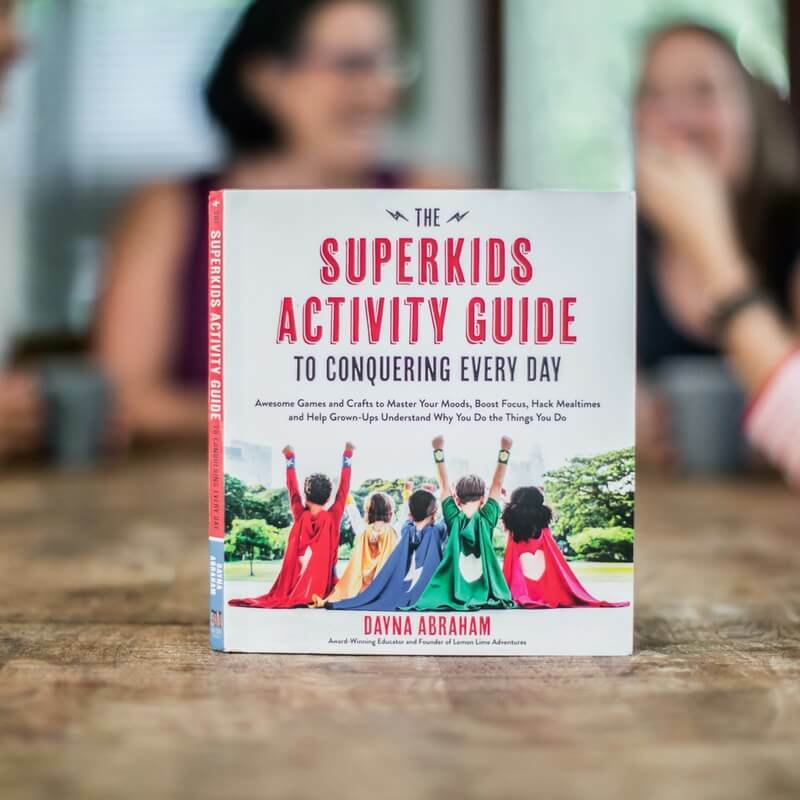 The Superkids Activity Guide to Conquering Every Day does just that. It’s a game changer, folks. This book isn’t just a book. One that I am thrilled to be partnering with. Because this book stands for everything that I believe in. And you can join the movement right here. So many of our kids are misunderstood. As we’re racing to soccer practice then home to get schoolwork done and put dinner on the table, our child has an epic sized meltdown over broccoli. We’re almost as tired and cranky as they are. And our patience is shot. Just eat the damned broccoli. It’s easy to roll our eyes and label them as obnoxious or picky or bratty. 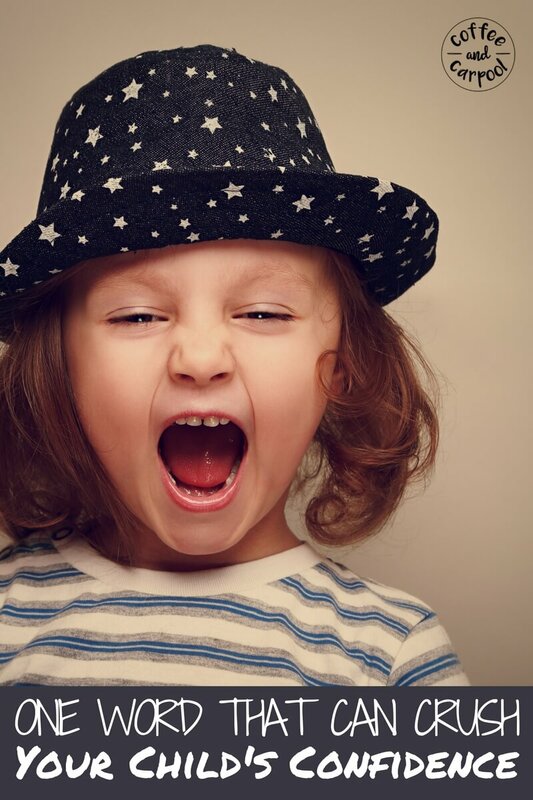 We tend to label our kids based on ALL of their negative behaviors: bossy, wild, mean, meek, anxious, careless, dishonest, naughty, impulsive, greedy, stubborn, lazy, moody, sneaky. But are our kids really those things? Or is that just our perception? A lot of it comes down to how we label our children and how we talk about their behavior. My perspective shapes how I see them, how I react to them, and how I interact with my kids on a daily basis. She tells others what to do. She has a strong opinion. She encourages others to join in. If they’re unsure, she’ll tell them exactly what to do. She has a plan, and she makes it happen. Is that bossy or is she just a natural born leader? A strong, determined thoughtful young lady. She’s a superkid. His room is always a disaster, five seconds after he cleans it. He leaves a trail of Legos, markers, and tape wherever he has been. I will not walk into his room barefoot in fear of tripping over his latest project. So is he really “messy?” Or is he creative? A creator. A builder, an architect of the future, an engineer. He is going to move mountains with his creative mind and his inventions. He is a superkid. Or is she adventurous and spirited? She will stand her ground when she feels wronged. She will demand what she feels is only right. She is determined and fierce. She is strong and refuses to follow a path she does not want to take. She will instead forge her own paths in life. She is a superkid. 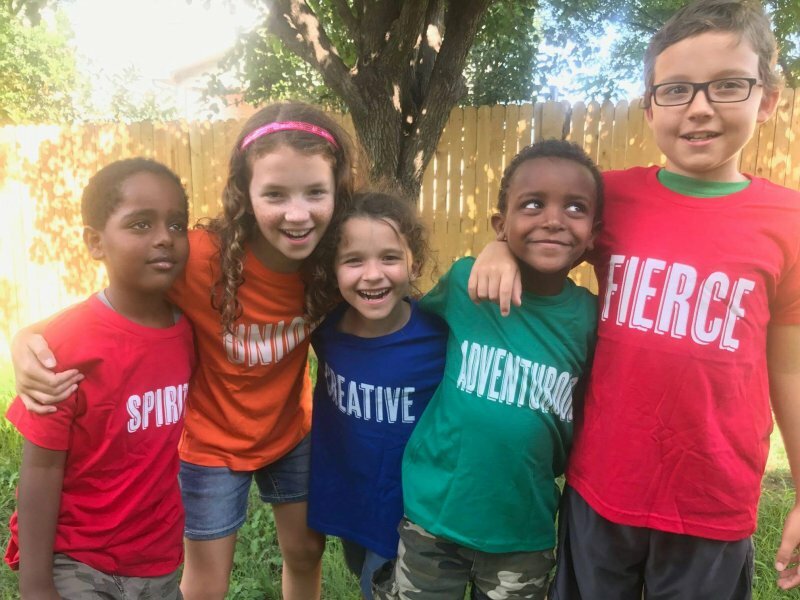 Labels for our kids can be beneficial, but only if we’re setting our children up so their inner monologues allow them to see themselves as the superkids they really are. If our labels let our kids walk taller, prouder, and more confidently into this world, then they can focus on being true to themselves and being the rockstars they have the potential to be. Because they really are Superkids. We just have to make sure they know it every day. Are you ready to join the Superkids Movement with me? 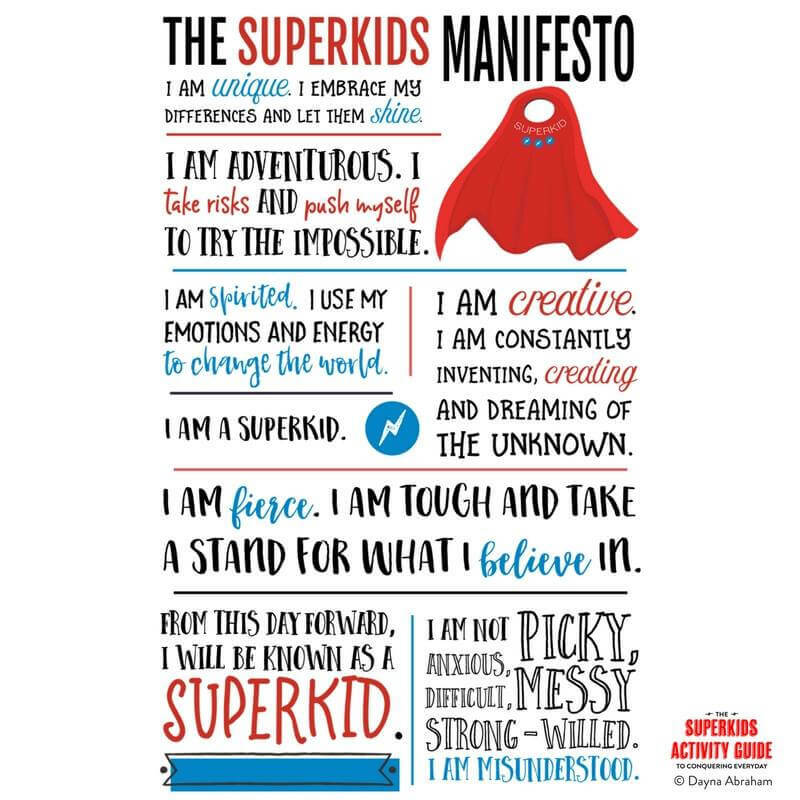 If you want to help your kids see themselves as the Superkids they really are, get The Superkids Activity Guide. It’s Amazon’s #1 Best Seller!! I have purposely avoided parenting books up until this point (admittedly, not very long as my oldest is not even three); however, this really grabs at me. I had a lot of self-image issues/doubts growing up and I’d like to have some tools to help my kids not be that way. I checked out the links but couldn’t really tell… since this is an ‘activity book’, is there a suggested age range that the activities are guided towards? Thanks in advance. The activities were designed for 5 to 12-year-olds, but can absolutely be adapted for younger kids and for older kids! To adapt most of the activities for your 3 year old, you would need to do most of the reading. Thank you for sharing! This book looks like a great read. I agree our words are everything to our kids! They hold onto everything we say and that is good and bad. Thank you this is a perfect reminder to me of how I should be looking at my child! I felt this post in my soul. Hate when ppl try to tell which twins is which by asking me who is who. Great share ! I love the idea of putting positive spins on previous labels! I was labeled as a teenager, and that shaped me in a way that was not the most positive. I don’t want to do the same thing to my child as he grows up. Thanks for sharing this post! Yes, I understand where you are coming from. This is the sort of discussion my wife and I have had. We need to realise that how we treat our children will have an impact and affect them as they grow into adults. Sometimes we just need to change the angle we are viewing the world from! Thank you for this article! I’ve been really struggling with my sons behacior and I can’t wait to try some of your tips! OMG! I often called my middle child “messy” and my third “bossy”. I tell my 16 yr old that he is lazy all the time, because all he does his sit in his room and play video games, won’t even go outside. I can now see how negative those words can be. Eliminating those words from my vocab. Love the message behind this post. We are all unique and have wonderful gifts to offer the world. Sure my 6 yo is stubborn, can be a challenge and is super rambunctious but his leadership, unique ideas and strength of character are elements we hope to encourage not break down. Thanks for this!